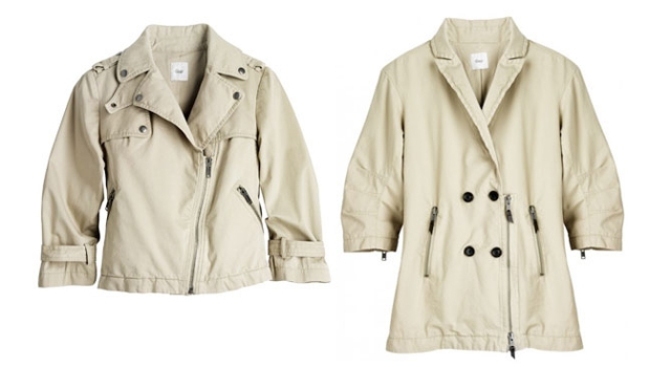 Alexander Wang's khaki zippered jackets for the Gap. Start lining up now. After their super-popular "white shirt" designer experiment last year, the Gap is at it again for this summer—enlisting of-the-instant labels Alexander Wang and Vena Cava to create some pieces for to sale in Gap stores starting June 16. Teen Vogue got wind of the collaboration through an interview with Patrick Robinson, who gushed: We have Alexander Wang doing the next CFDA collaboration, like what we did with the white shirts last year, only this year it's with khaki. He did this incredible motorcycle jacket in khaki that's going to be under $100. It's coming out on June 16th, so get ready!" A tipster at Racked sent around some images of what was then only known to be an Alexander Wang collaboration ... and everyone worth their salt immediately recognized those iconic prints to be the work of the design duo at Vena Cava. Now, Refinery29 has put all the images together in one place. But as they say, they're "underwhelmed," and we have to admit that for the price tag—apparently the motorcycle jacket is going to retail for $94—we might have expected a few more bells and whistles. But ... we're brats.